The affordable KastKing Triton Dualis spinning reel has innovation developed by anglers for anglers at its core. KastKing Triton Dualis spinning reels features high and low gear ratios that can be selected at any time. Triton Dualis two-speed reels offer the opportunity to use the same fishing reel with changing conditions or techniques. Its low speed gear-ratio with more torque covers bottom fish and the use of bigger baits to bring in big fish. KastKing Triton Dualis’ high speed gear ratio offers a faster retrieve speed for anglers who want to burn lures across the water at high speed or turn fish away from heavy cover quickly. 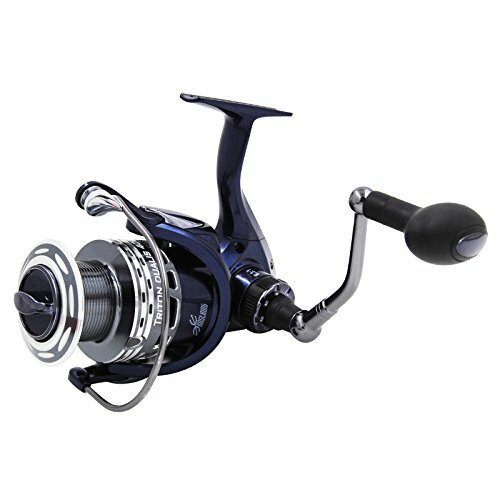 A Dualis spinning reel is built with high technology and quality: CNC machined aluminum alloy handle and Power Launch Spool for farther casting, precision gears, triple disc carbon fiber drag washers, unbelievably light but super strong graphite body, and computer balanced graphite rotor. Triton Dualis spinning reels are saltwater approved. Triton Dualis 5000 Weight(g/oz) 23.98oz/680g / Max Drag LB/KG 22LB/ 10KG / Gear Ratio 3.7:1 / 5.4:1/ Line Capacity (mm/m) 0.40mm/220m, 0.50/140, 0.60/100 Monofilament Capacity (lbs/yds) 16LB/220Yds ,20/170,24/140A KastKing Triton Dualis spinning reel is valuable for kayak fishing, canoe fishing, or small boats; you can cut the amount of tackle on board in half by virtually having two reels on one fishing rod. It eliminates on board weight and clutter, or if space is available, Dualis doubles your fishing tackle options and puts a high quality reel in your boat. KastKing Triton Dualis performance is unmatched two spinning reels in one! Whether you need a spinning reel for saltwater or freshwater fishing, cover all of the bases with a KastKing Triton Dualis two speed fishing reel. It’s like nothing else out there! Dualis reels are built with tough saltwater safe corrosion resistant components: stainless steel main shaft, 10 shielded stainless steel bearings, aluminum alloy spool and handle, and high-modulus graphite components. Dualis 4000 and 5000 fishing reels have incredible fishing power – 22lbs/10kg of carbon fiber drag. A double bearing main shaft support prevents power robbing torsional twist and shaft misalignment, and eliminates shuddering under heavy loads.